The movie, Dunkirk, directed by Christopher Nolan, is in cinemas now... you may know Nolan from Batman, but... go see this movie. Go see it. The movie doesn't attempt to portray the en-masse story of the hundreds of thousands of soldiers and wounded airmen, British and French, stranded on the beaches of Dunkirk, surrounded and bombarded and shot at by the enemy. Instead, it takes the stories of a few, and shows the bravery and terror, the determination and the fear, the pride and the suspicion, the might of the machine and the strength of numbers in the face of something impossible, through the experiences of those few people. You watch, and your heart and mind is multiplying by 300,000... the number of British who were rescued from the beaches by a flotilla of small boats, mostly manned by civilian volunteers. You watch, and you imagine the beaches and the thousands upon thousands being strafed by machine guns, bombed and blasted. You watch, and you see all the fine young airmen who risked their lives to protect others. And you wonder... why does war never end? I left the cinema in tears, in the middle of the day, and my smartphone is telling me how much closer we are to the next one, with every presidential tweet. Where does this movie review fit into the family history, you may ask. My uncle Brian Carvell (1920-1980), my favourite uncle, was on that beach during the last days of May or early June, 1940. He was wounded, on a stretcher, 19 years old; a member of the RAF (Royal Air Force). I don't know what happened to him as an airman, but he ended up on the beach at the battle of Dunkerque, France. People were shooting at him and his fellows, with machine guns; guns on one side, waves on the other, nowhere else to go, until the little boats came from all the ports and harbours around the coast of England. Uncle Brian was rescued; he came home to England, but to hospital, eventually to the hospital in Saffron Walden, Essex, England, not far south of Cambridge. 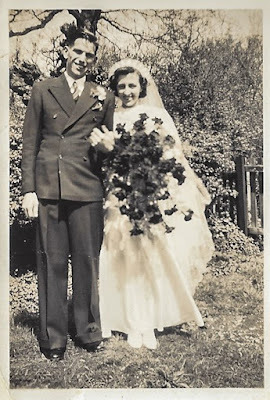 In 1943, Uncle Brian married Betty (Elizabeth) Sell. 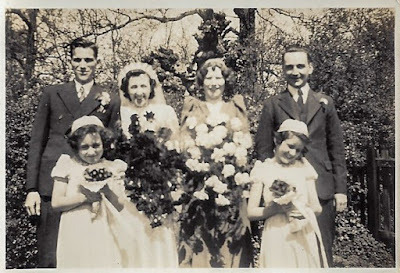 I believe my Aunty Betty had been one of Brian's nurses at Saffron Walden: they married there, and their son Christopher was born in the town of Saffron Walden, in 1945. (I don't know for how much of these five years Brian Carvell was being treated in the hospital--the records are not available to me.) 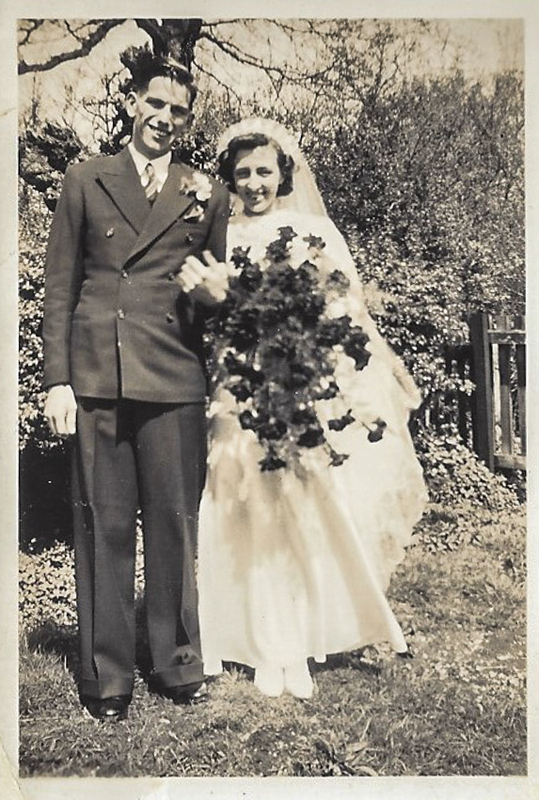 The trauma of the experience at Dunkirk stayed with him; he'd protect Aunty Betty, on the street, from the machine-gun fire of motorbikes and cars backfiring. 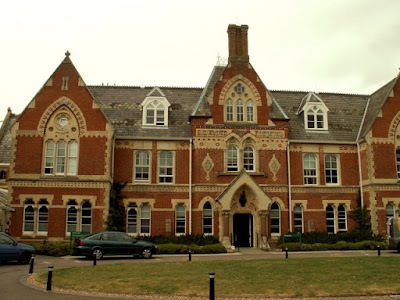 Later, the family lived in Brinklow, near Coventry and Rugby: Brian worked at Rolls Royce; he was a technical author. I remember their home there: walks through fields full of cows (my mum was scared of cows), of visits to my uncle's neighbour, who kept chickens; the smell of fuel from Brian's miniature steam engines, of staying, on my own, with Uncle Brian and Aunty Betty and playing a board game called Buckaneer which I loved but which I've never been able to track down. It was about pirates and treasure. My ninth year, we were between houses; my parents had sold the house on Albert Street in Syston, Leicestershire, England, and had not yet bought the bungalow on Brighton Avenue. My dad was working at Rearsby aerodrome, at Auster Aircraft, making the wooden insides for light aircraft. We were living in a wooden house owned by Auster Aircraft, on the edge of the newly-started, brand new "village" of East Goscote. I guess our home had once been a barracks. There were several families of Polish people living on our little lane, in the barracks housing too. Across the street, not demolished yet to make way for the new houses, were old military storage shelters, weed and grass-overgrown roads and paved areas, lots of big, square earthen banks to climb up and down--storage depots with the roofs removed--and masses of yellow-flowering gorse to hide in. The gorse had grown so old and big it that there were tunnels between the thorns. There were rabbits everywhere, and there was a fat fox in the centre of the cornfield behind our home when they harvested. How I loved that summer! Like magic, on my birthday in October, Uncle Brian turned up at our little wooden house, just four days before my baby sister did. He didn't bring a birthday present of chocolate, or a doll, or anything silly like that. He brought me a big, heavy, old-fashioned Remington sit-up-and-beg typewriter, and a teach-yourself-to-type book, the sort that the typists at Rolls Royce used. That was the best birthday present ever. I learned to type. I worked as a technical author, too, for years. Uncle Brian was the kindest, gentlest man. I can still hear his quiet voice and see his gentle eyes. To my regret, I didn't ask him about his experience at Dunkirk. I was too young. And then when I was old enough, I still didn't ask. He certainly didn't talk about it to me. Maybe that's OK. Maybe it was enough for him to live through it, to survive, and to be the best uncle a girl could have. Brian Carvell, Betty nee Sell, two people I don't know. The bridesmaids are Topsy on the left, and my mum, Bette, on the right.